What is wrong with people? Why don’t they criticize those who weren’t raised Christian but then later converted to Christianity? Oh, wait… that’s because according to them the convert would be joining the “good” side…… Whatever. That Jews, Judaism, Jewish history and tradition is labelled as excrement by the NT [Phil 3:8] and believed ‘secretly’ by Christians and Messianics is readily apparent in the screen shots that follow. Now all of the above is posted by Gev of Rosh Pina Project. 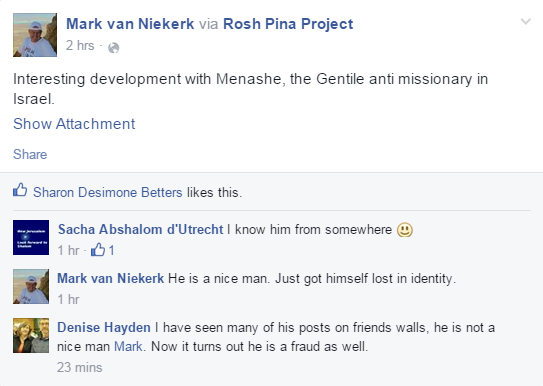 The identity of Gev is uncertain since he/she anonymously hides & posts but insists on knowing about everybody else. The rules of openness obviously do not apply to him/her. Perhaps there is something more sinister about Gev? Perhaps he/she has a questionable identity which he/she has not resolved yet? He was born and raised as an Anglican, so just how he got named after John T Walsh [Adventist] is a bit of a mystery. The last time Menashe checked with his parents they were still Anglican and his grandparents were a mixed bag of two Anglicans, one Methodist and one Roman Catholic. He also remains happily married for 23 years to the same woman despite rumors to the contrary and efforts by some on Facebook to add him to groups like Israeli divorced singles etc… I mean really the lengths to which people go to sometimes! 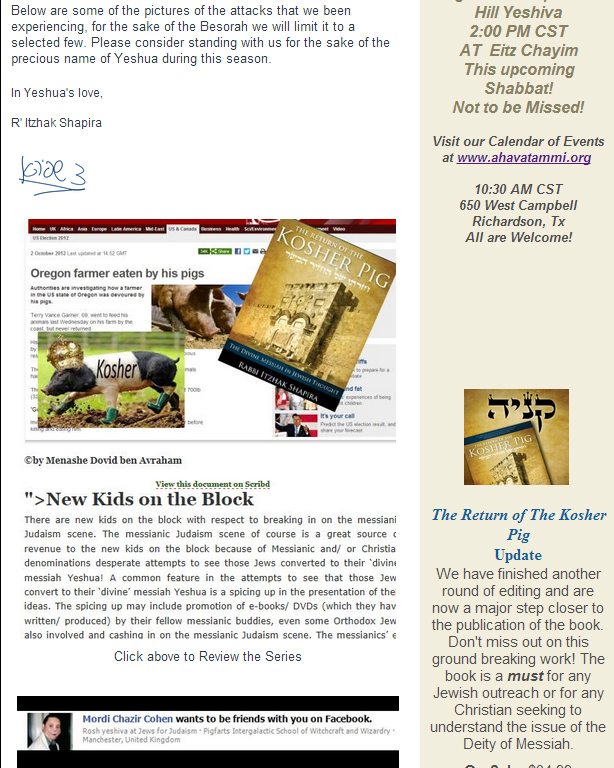 The Manchester Beis Din did not do a conversion of Menashe Walsh. In fact Manchester Beis Din does not do any conversions; they leave this up to the Beis Din in London. Manchester only acts in a supervisory role for folks going through conversion who are living in the Jewish community located around the Bury, Salford and Manchester boundaries. My family and I have been living in Israel close to 9 years now. Aliyah is a risky venture even for those who have extensive extended family support here in Israel. Our story is no less remarkable than any other Jews who make Aliyah and the recent marriage of our oldest daughter is a source of great joy to us and the Jewish community which we live in. We are also fortunate unlike some converts in maintaining our close familial ties and associations. 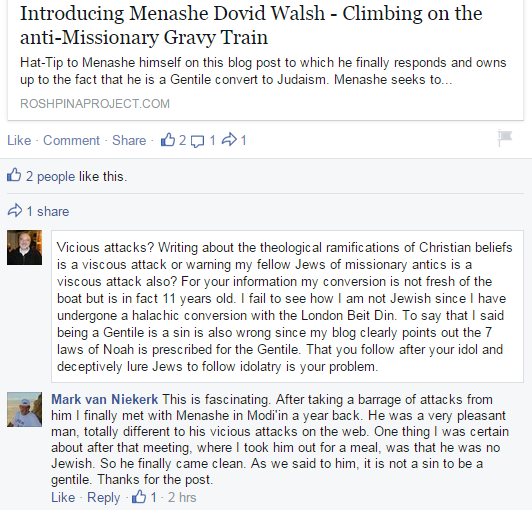 As to Mark van Niekirk, who at least has the courage to be identified unlike Gev: Mark, you are deceptive to the core and cannot be trusted, may your sins find you out. A deliberate exploitation of computer systems, technology-dependent enterprises and networks. Cyber attacks use malicious code to alter computer code, logic or data, resulting in disruptive consequences that can compromise data and lead to cybercrimes, such as information and identity theft. 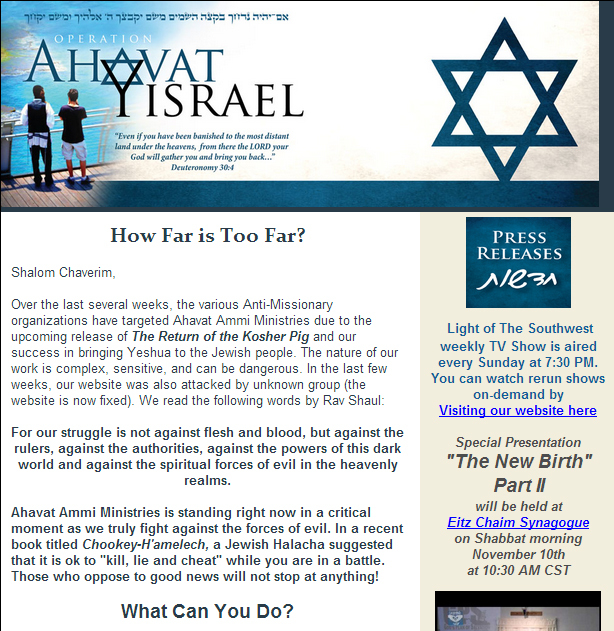 A cyber attack however, according to some is the writing of articles which question the authenticity of the use of rabbinical material and to come up with the idea that a divine messiah is a pig which becomes kosher to Jews. Apparently by just accepting what they say and getting those donations in as soon as possible to support the ministry, will help those hell bound Jews avoid the eternal BBQ! In the new definition of terms it appears those who have a brain to think for themselves and express those thoughts are evil, slanderous and who go about using malicious code to alter computer code, logic or data too. You may compare and edify yourselves with respect to what construes a malicious cyber/ slander attack and here in what follows below. Well it has finally happened I cannot say I was not warned: “Writing reasoned articles will only get you into trouble and notoriety”. 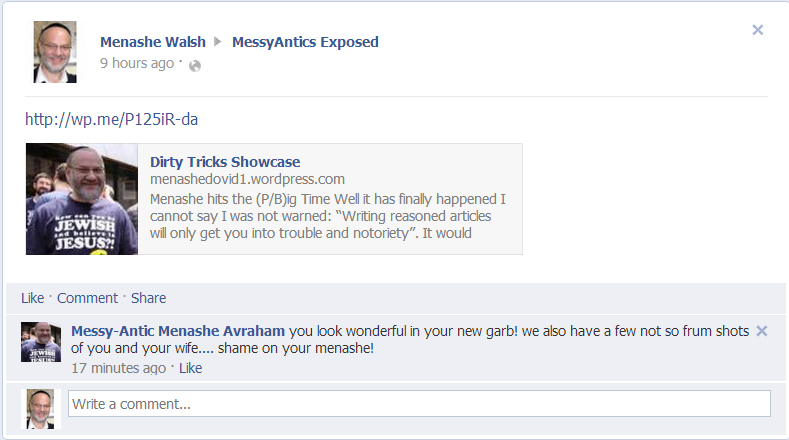 It would appear that articles on my blog have irked somebody in the messianic masses somewhat! They have created a spoof Facebook Pages of myself, how nice!! The cover photo has been Photoshop’d very well but the other stuff a bit rushed! How sad that in the face of reasoned arguments somebody has to go to these low down levels (to even include my wife’s picture) to get their message across. Worst of all that the folks who are presenting themselves as Rabbis would possibly befriend such nonsense. As ever I let my real friends and those who wish to search truth for themselves and my blog to speak for itself. Now just waiting to see how long it will take for accusations to start to flow that the stuff above has all been done by the “anti-missionaries”. I am now getting a bit of an all too familiar concept: Gentiles / apostate Jews put poison down well and Jews get blamed for poison in well because of their religious practices and expressing what they think. What scum. Are these people Messianics? What a wonderful advertisement for their religion. NOT! 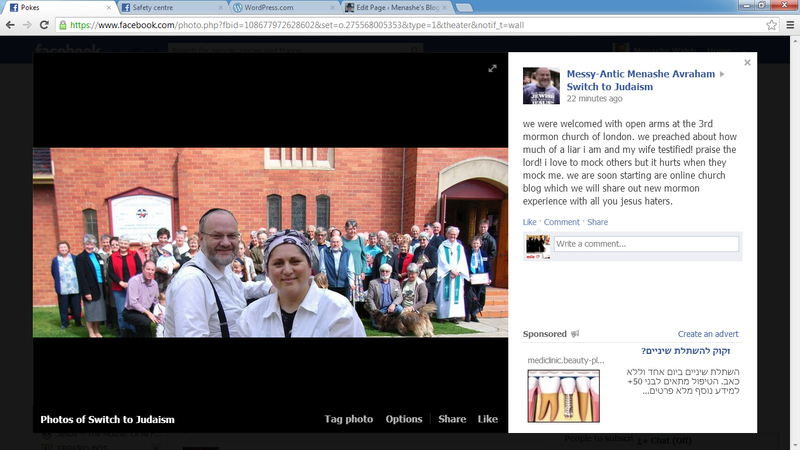 No they are not Messianic! Are you kidding me? 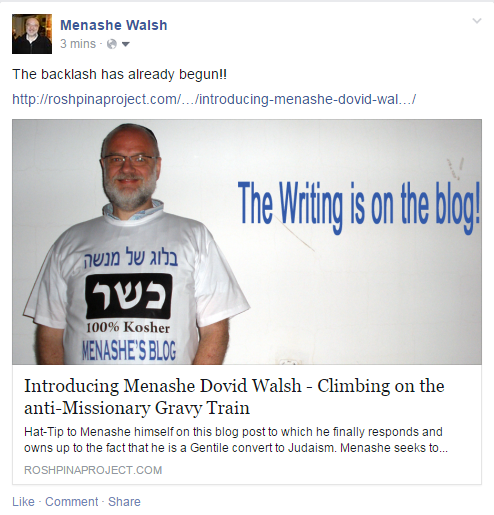 Stop Menashe, Where is your G-D? 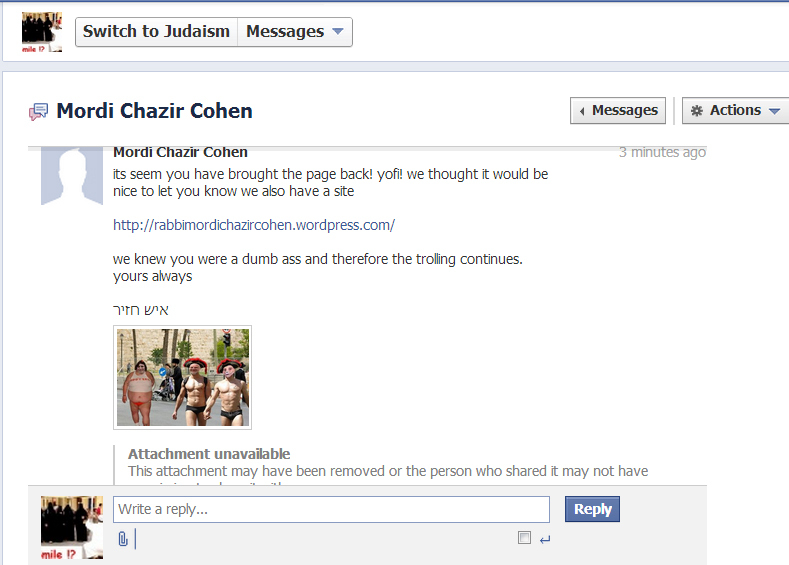 I was the one who informed R’ Cohen of this and you as within 5 minutes I realized that this person is sick. I am the one who called Australia out of my own money. 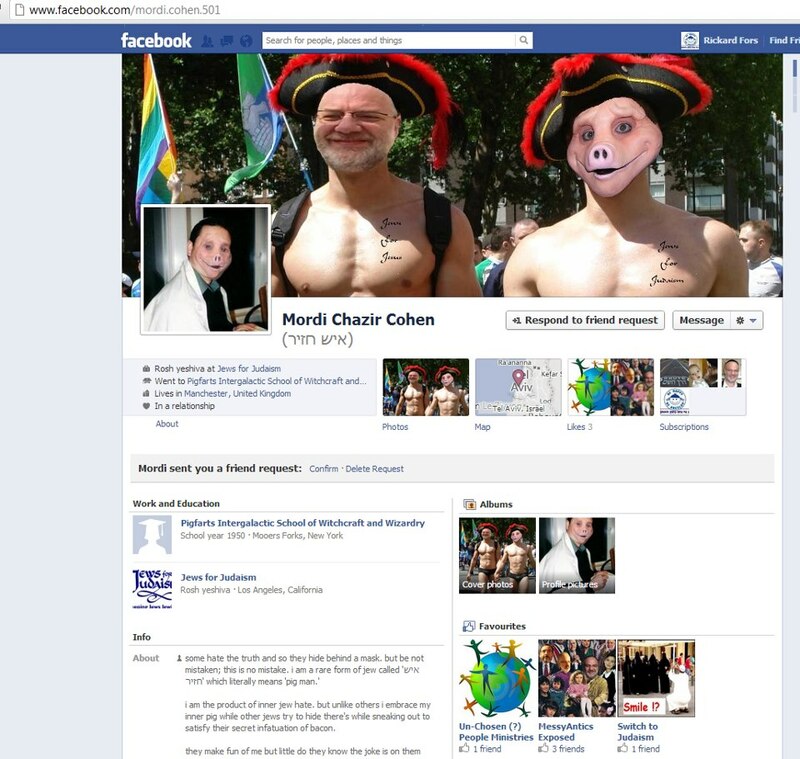 This person has targeted us and my book “The Return of the Kosher Pig” as our website was hacked twice now. You already suggested through your manipulative posting that we had something to do with it. G-D knows the truth, and so are you. We have been victims of your articles for about 8 weeks now, but we would never do such a thing. I honestly have no time for any more of this nonsense. 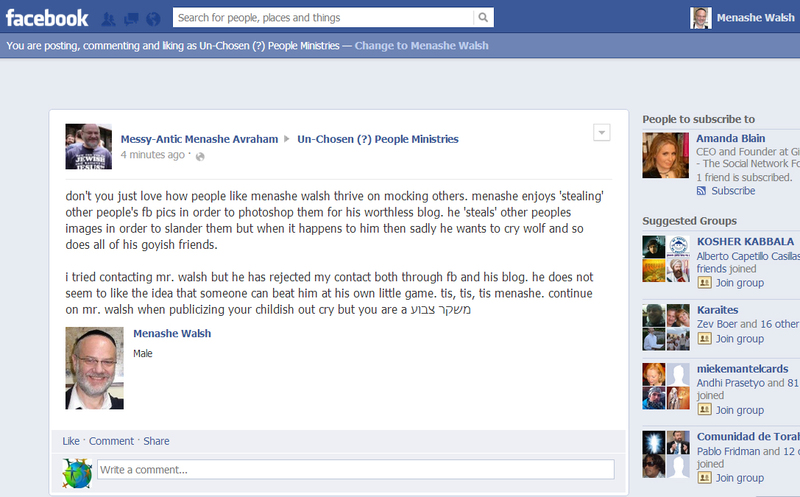 I had to deal with “fake reviews” of my book, L’eshonot R’ahot and Rechilot, website hacking. Our work is work of H’etadbrot. 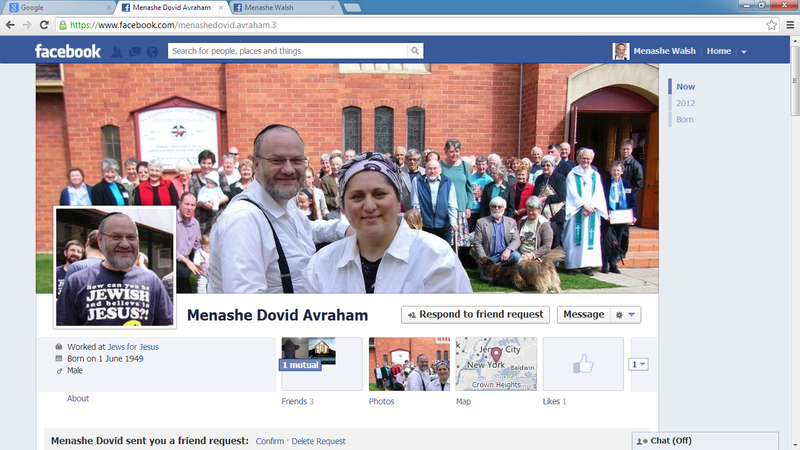 I suggest that you remove the picture of Ahavat Ammi Menashe as you are taking part of H’otzahat Diba Menashe. Where is your G-D? This is not the way of the Torah. Read Lev 19:17, show it to your Rabbi, and ask him if what you are doing is kosher. “Victims of his articles”, no, you keep saying he is slandering you. What is slanderous about YOU making absurd claims about idol worship and using it to somehow validate Torah or not, while pushing paganism, and you are mad because they bring you to task on it? You people are intrusive. I had a baby and in comes this woman in my hospital room, i was sleep deprived and she woke my baby, asking me if I needed prayer, because she is “Jewish” too. Uh no, there is he door, thanks a lot for wasting a second of my sleep, and i never got back to sleep. You are no longer of he Jewish religion. Your grandparents would be mortified. If people list themselves as Jews, we don’t wish to be bothered. You are a clever one, but we see you. Now we just have to set all of our Christian friends straight. G-d forbid they go near a cult that preys on people and makes a mockery of our Torah. SHAME. What Jew is going to listen to a book that rambles on about what is refuted plainly by scripture. Way to play victim. Whoever did the above is obviously somewhat twisted in the head. At first they won’t listen to you, then they will argue with you, then they will character assassinate you and then they will try to harm you (not you personally of course). Seen the same pattern all through history happen to various people, political and religious, who stood up for truth and influenced those around them. However I think in the above case it is obviously the work of an unstable human being…even the messianics themselves are saying it! I enjoy your blog. Please keep up the good thoughts. It is really scary this cult they try to call Judaism. I don’t understand why they have to try to appear Jewish. It’s so annoying to google anything jewish and that drivel comes up. I really want to see rabbis address this book for people. It makes me sick how deceptive they are. Listening to tzahi reason at all makes no sense. How can you take Torah and compare it to the ultimate anti torah, how do you explain it? You can’t! Scary. So sorry for atrocious grammar and sentence structure. My device is not thebest. To err is human but if you really want to mess stuff up use auto text!! You can be sure that any response or action from missionaries, messyantics or xtions in general will be a lie much the same as their father of lies, Paul, or some fashion of underhanded dirty trick deception! Rock on Menashe!! I did not even know who Itzhak Shapira was till very recently… when his advertisement showed up in my sidebar. I clicked on it and was SHOCKED by the prices he was charging $1,500 for his fake Yeshiva and $500 dollars for each individual sermon. Like I said… I did not know who the guy was …he was just another Messianic ripping people off to me to me. So I made a post about this on facebook– about my little experience of clicking on his ad and on how Messianics are ripping people off…. and how it is wrong to make money off the Word of G-d. 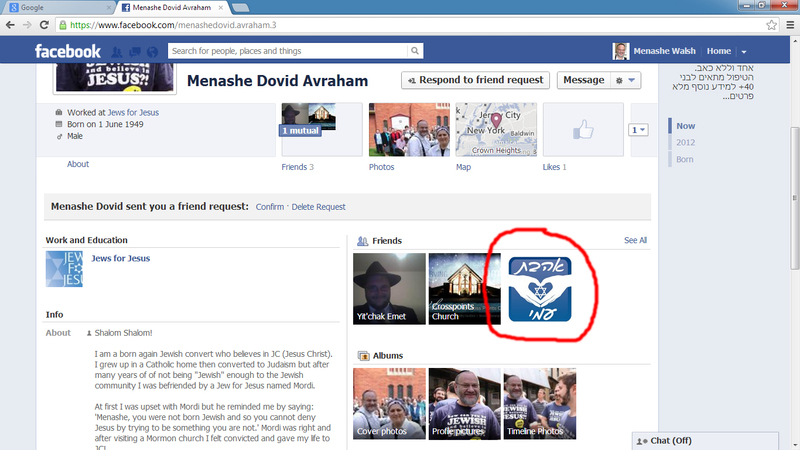 Within 5 minutes Shapira [who is not even on my friends list] was on my page accusing me of Lashon Hara and demanding I do Teshuvah. Totally laughable. I told him that scam artist using the Lashon Hara Card ….was “so played out” and that HE NEEDED TO DO TESHUVAH and stop ripping off unsuspecting gentiles. Needless to say Him and His buddy Kehilat Melek Israel immediately went all out to destroy me. They Ignored all scripture that I quoted [example : Come, all you who are thirsty, come to the waters; and you who have no money, come, buy and eat! Come, buy wine and milk without money and without cost.] and they had no interest in TRUTH, TORAH, WHAT JESUS/YESHUA SAID ABOUT SCAMMING PEOPLE, HUMAN BEING, HUMAN SOULS………………… Their only intrest was destroying me. It was a bit shocking for me at how evil that they REALLY WERE…..as I more or less thought these “Jews for Jesus types” were just “mislead” until this experience. I am very nice and patient with Messianics and Christians by the way. However throughout this conversation I saw with my own eyes that they had NO LIGHT IN THEM and that it was 100 percent about MONEY. 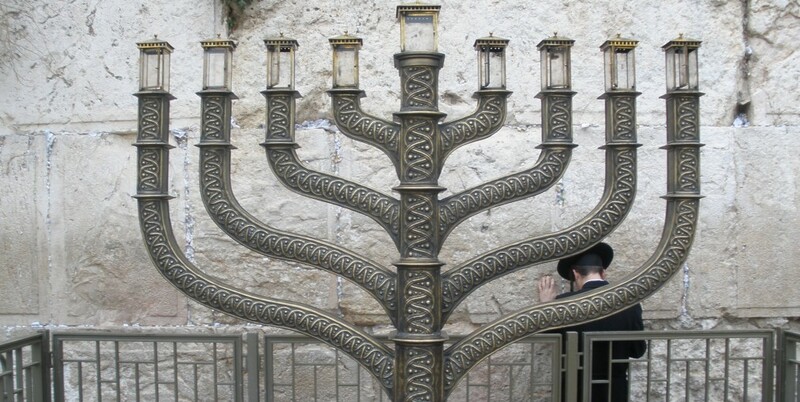 I continued to stick to the Truth and compose myself as per Torah through all their attacks [I always keep myself within a Torah Fence …no matter what people stoop to]. 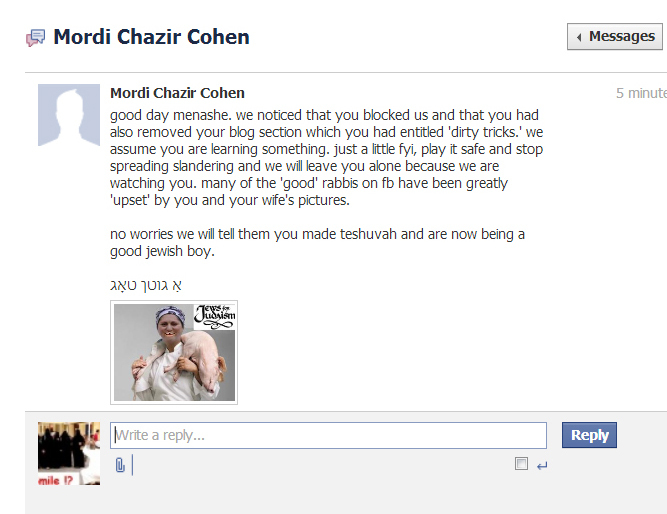 By the end of the conversation they were calling me GOY repeatedly and SHIKSAH (WHORE) repeatedly. I was SO SHOCKED. I mean I was genuinely shocked. 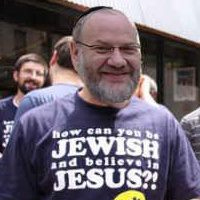 Like I said I always thought that these Jews for Jesus Types were just “Mislead” but for people who call themselves RABBIS to behave like this……. running around screaming at women and calling them WHORES and GOYS……………..It was just absolutely shocking. My only response to all this was, “WOW…….that is classy” and ” please keep demonstrating yourself…..please keep going.” Needless to say I became keenly aware that there is no “NAIVE” to it. These missionaries who act so nice and sweet and kind on Television are just absolutely monsters behind the fake plastic evangelical suit. They are intentionally deceiving people and their only interest is protecting their money source. I quickly put the pieces together. Hummm Their ministry is called “AHAVH AMMI” and is promoted as “caring about their people so much” and yet they run a Yeshivah that is 100 percent for gentiles in which they charge beyond outrageous prices. Needless to say…..It is safe to say……..It is not about love for Jews or love for gentiles Gentiles. It is about MONEY– nothing more or less. After my experience women started to contact me and show me conversations with the same pattern– bashing and abusing women, calling women degrading Names such as “whore” ..”goy”…”gentile women”, and demanding immediate Teshuvah from people who had done nothing wrong. In conclusion all I can say that these are wicked evil men and the Messianic Movement is just the Newest way to sell books, cd’s, Memberships to fake Yeshivahs, and EVERYTHING ELSE. The SADDEST PART OF ALL is that it is the Jewish people who are USED AS BAIT. It is the Jewish people who are used as bait to exploit gentiles out of their money. Do not do onto others that which you find offensive to you. That is the whole Torah, the rest is commentary. Go forth and learn. 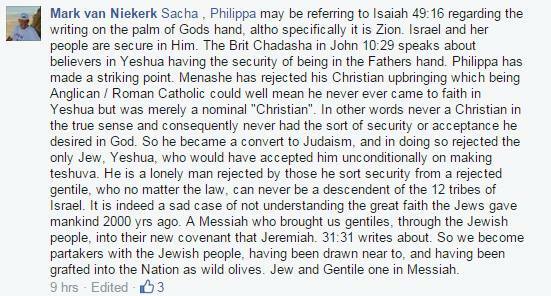 Hillel, 40 BCE If you believe Torah is true, then show some respect for Menashe Dovid.